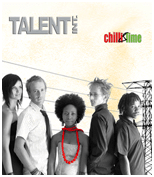 Chilli ‘n Lime is a dynamic young jazz outfit that has recently started making waves on the local music scene. This innovative collaboration ofJohannesburg’s finest talent draws on a fusion of styles including Latino, African favourites, funk and traditional jazz. Since their inception in late 2006, Chilli ‘n Lime has performed alongside South African artists, including Mango Groove and Judith Sephuma. These musicians in their individual capacities have also performed world-wide with well known artists such as Sibongile Khumalo, Themba Mkize, and Lauren Hill. They have representedSouth Africa on a number of cultural awards and have performed at Jazz Festivals including New Orleans, USA in 2005. They have also performed at the Elton John Charity Ball in 2005, Miss South Africa in 2005, and the South African Music Awards 2007.